Bek and I had a bit of a hard time deciding which herb to feature this month. Now that it's May, and spring has sprung in the Northern Hemi, there are a bounty of wonderful herbs to chose from. In the end, we settled on a plant which is both good eats and primo medicine. 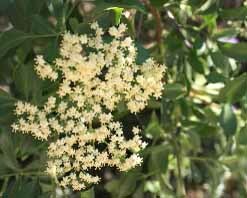 Meet your herb of the month for the Wild Things Round Up - Elder flowers. Now, I'll admit, I'd never seen an elderberry bush before last year. But on one of my favorite bike trails, I kept passing a group of trees in spectacular bloom, and I wondered, is it elderberry? I finally got my answer once it fruited, because it's drooping clusters of fruit are unmistakable. Once I knew I had elder on my hands, I went crazy harvesting the fruit. I dried quite a lot of it (eight pounds before drying), and made a big jar of Rebecca's elder elixir. I also made some fun recipes with it, like Squirrel Fricassee with Elderberry, Juniper, and Wild Onion Gravy. But I knew the fun was just beginning, because come springtime, I'd have access to the flowers, which are quite powerful and adaptive medicinally, and have a wide range of application. Please hop on over to Cauldrons and Crockpots to learn all about elder flower as medicine. 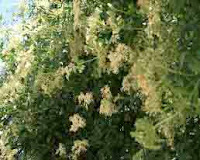 Elderflowers are also a wonderful ingredient in recipes - elder flower syrups, fritters, and wines/champagnes/cordials are common. What sort of wild recipes can you come up with for elder flowers? 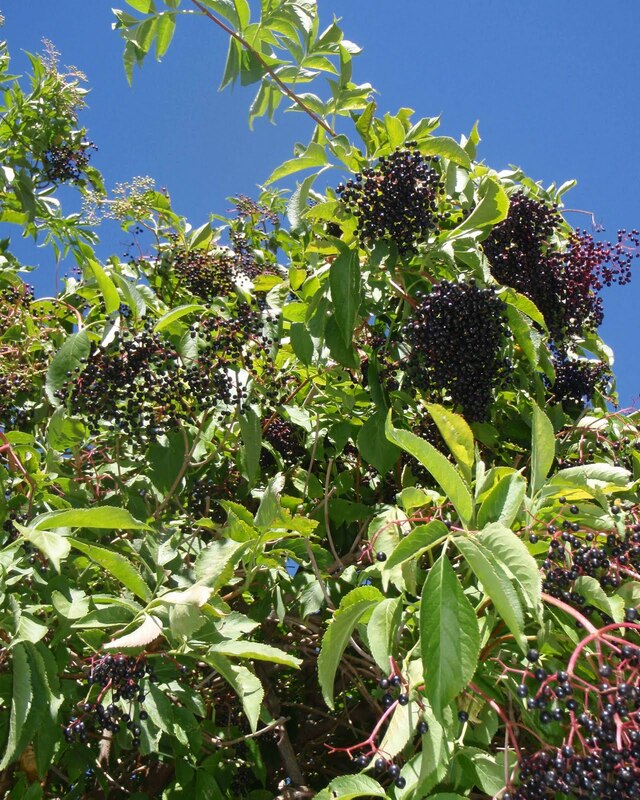 Elderberry is a deciduous shrub, from 10-25' tall, with opposite branch that usually come up from the base (lacking a main trunk). 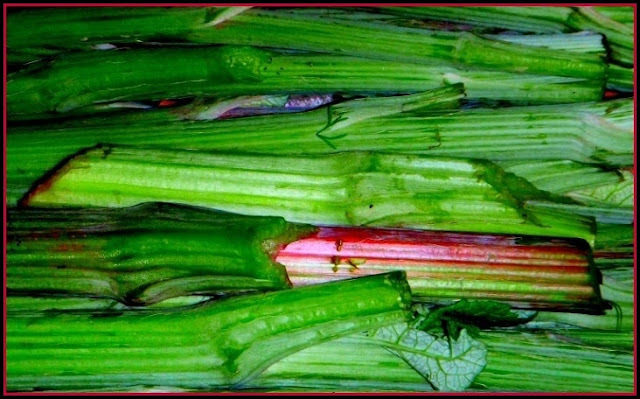 It's leaves are pinnately divided, which means that they appear on either side of a central branch, like a feather. 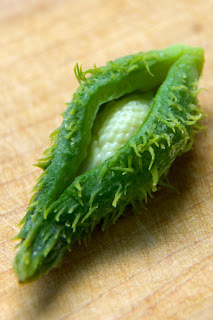 The leaves are from 2-6" long, and are serrated around the edge. Elder flowers are creamy white and quite small (from 1/8" - 1/4"), and form crowded flat-topped clusters. The elder bushes can be found near streams, or in open flat areas. In my area, they are often escaped ornamentals, and populate the sides of ditches and old properties. 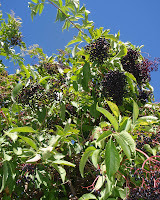 My favorite elderberry bushes, however, are in a kind neighbor's yard. Many thanks to Bek, who made a run especially to secure these pictures! How's that for a dedicated host?! As you're in the US, you may wish to talk about the three species of sambucus which grow in your continent rather than focus solely on sambucus niger which most of us in Europe associate with elder. I wildcraft all my elder and had to smile when you said your elders were mainly escaped ornamentals. Most formal gardeners wouldn't give them space over here. I have two elder articles with various recipes on the UK Herb Society site Hedgrow to Kitchen http://www.herbsociety.org.uk/kh-main.htm You are welcome to use them. Hi Sarah, for all intents and purposes, they look the same, except for red elder, which has red berries. I get s. mexicana here in California and it's almost indistinguishable from s. niger as far as I know- when I go further north to harvest the latter the only difference I see is leaf and berry size. But it still looks the same. S. canadensis has red berries, but when looking at it in flower it looks the same. I was under the impression that s. canadensis was toxic, but Kiva said that it's only the berries and that she knows folks who use it without ill effect. I have no personal experience with it myself. Thanks for the links to your recipes! Great posts. Do you make elixirs with the entire flower cluster or separate individual flowers from the cluster. I've rad about the cyanide precursor interwove and am wondering if this applies to the flower cluster stemy-type bits.